Challenge #201 in the Life in the Natural World series. Hosted by RuthC. Recently, I hosted an 'Unwelcome, Undesirable Insects or Spiders' challenge. Today's challenge is for you to show us some of the beneficial insects or spiders which help mankind. Bees are an obvious choice, since they pollinate the fruit, vegetables, and flowers in our world. But there are many other helpful insects: silkworms produce silk, ladybirds, praying mantids, hoverflies and other insects prey on problem pests in gardens or farms. The golden silk orb-weaver spider produces silken thread which can be woven into breathtakingly beautiful garments. See https://en.wikipedia.org/wiki/Golden_silk_orb-weaver Make sure your entry is 1,600px MAXIMUM on its longer side. DPR does NOT resize your photos for you. You need to do this yourself BEFORE you enter a challenge. Entrants with oversize photos will not be invited to re-submit them. Get the size right the first time! ENTRIES BY MEMBERS WHO CHOOSE NOT TO VOTE IN CHALLENGES WILL BE DISQUALIFIED. 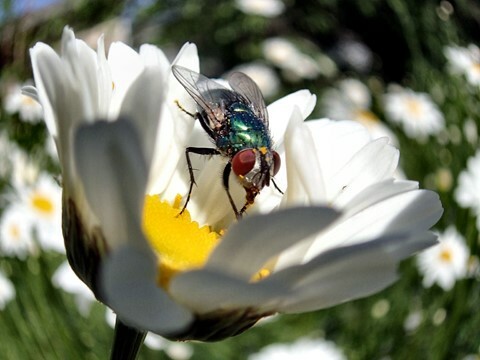 Fly on an Oxeye Daisy. Notes: Lens was touching petals on flower and Fly did not move.